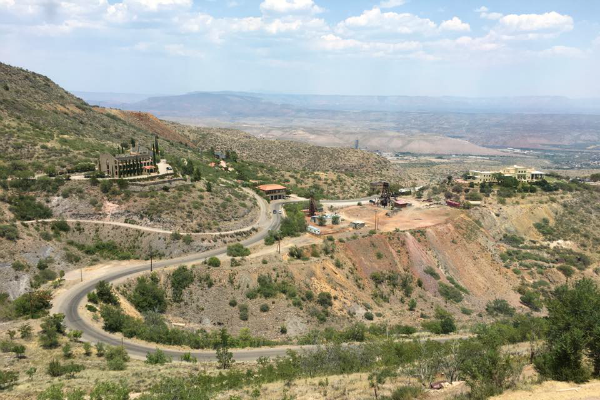 Last weekend my parents, Adam, and I took a day trip to Jerome, Arizona. 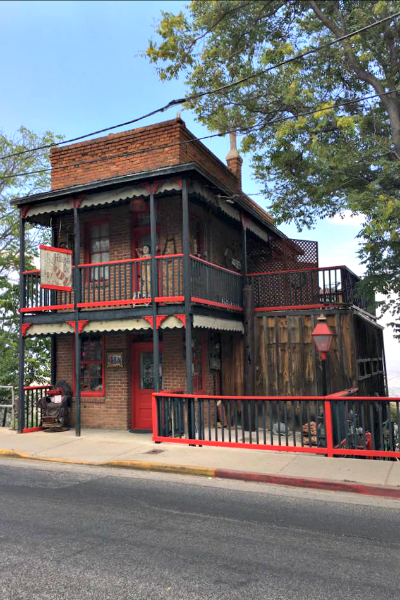 Founded in 1876, Jerome was once the fourth largest town in the Arizona Territory. At the time it was a booming copper mining town and known as the “wickedest town in the west”. After WWII the demand for copper dropped causing the mine to close and Jerome became a ghost town. A couple decades later artists re-discovered Jerome and people began trickling back to the town. Today Jerome is a thriving tourist and artist community. The town sits on the top of Cleopatra Hill (5,200 feet) and much of its appearance hasn’t changed in the past 100 years. Although due to its location on a mountainside, gravity has claimed a few historical buildings, including the town’s jail. We got there just before 11 a.m. so we explored some of the shops and then headed to The Haunted Hamburger for lunch. And yes, the building is believed to be haunted. You can read the full story of missing hammers, slamming doors, and photographs capturing the vague image of a woman here. 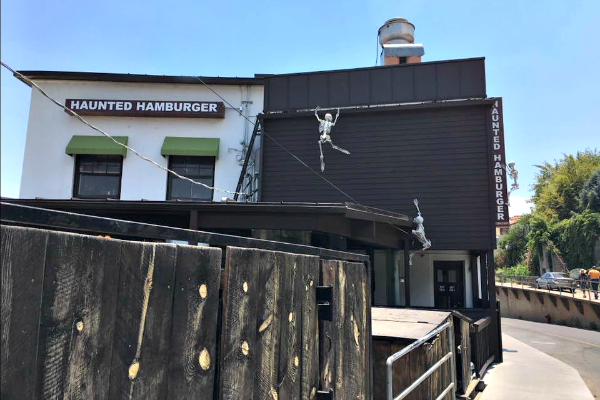 Even if you don’t believe in ghosts, it’s still a fun place to visit and the burgers are delicious! After lunch we walked around more of the shops and then stopped at the winery for a tasting. 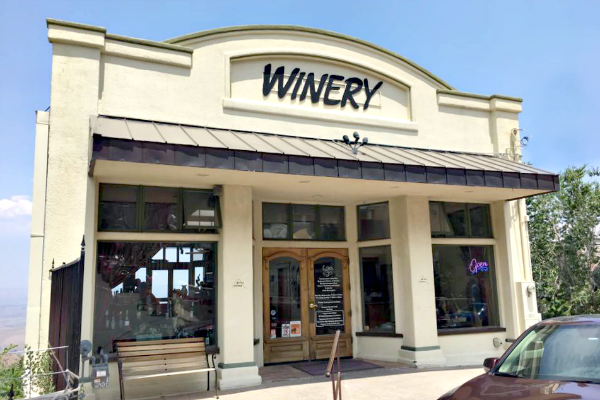 We sampled four of the local wines and enjoyed a glass of blackberry sangria. They also sell local artwork in the tasting room. 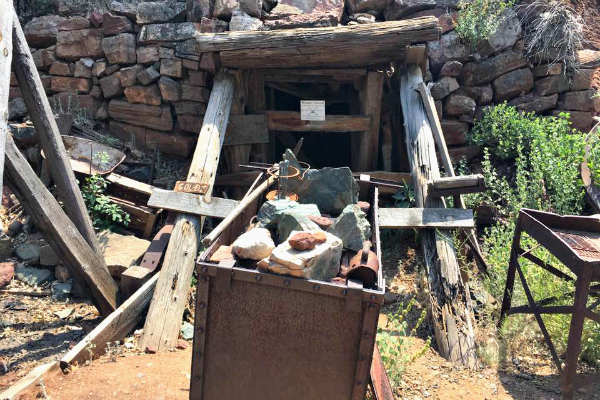 After we finished looking through the shops we headed to Gold King Mine & Ghost Town. 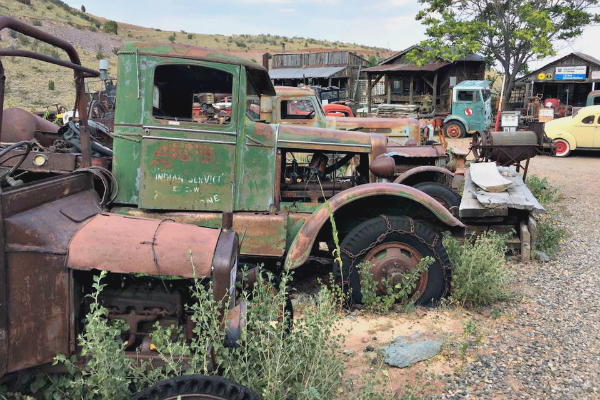 It’s only about a mile outside of Jerome and it’s basically a ghost town/old mine/junk yard. The site was built by local man starting about 30 years ago (he passed away late last year). 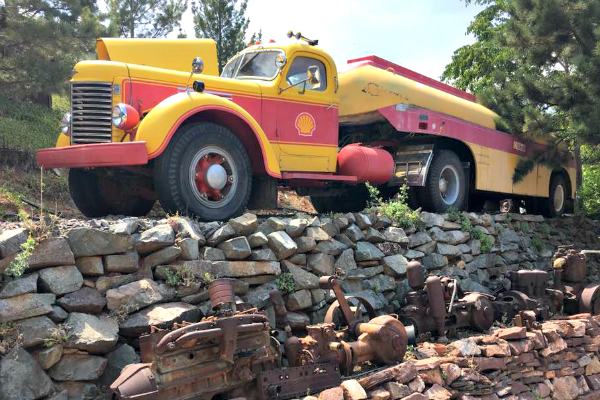 Originally there was only one building, but over the years he added other buildings and over 100 old trucks and other vehicles. The entrance fee is based on age (the highest fee is $5) and you can also purchase a bag of feed for the animals for $1 (totally worth it). Once you pay the fee you’re free to walk around and explore. There’s seriously stuff everywhere! My dad is a mechanic so he loved looking at some of the old cars and trucks. Most are in pretty rough shape, but we found a few that wouldn’t need much work to get them running. There’s also an old mine shaft on the property (closed for safety reasons). It’s really just a weird/random/interesting place. 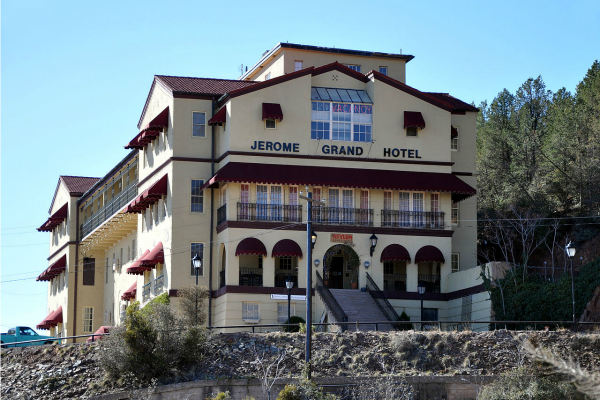 We didn’t stay the night, but if you do, I’d suggest staying at the Jerome Grand Hotel. It used to be the United Verde Hospital and is one of the most haunted places in Arizona. If you’re feeling brave, ask for a room on the third floor. The operating room was on that floor and guests report hearing the sound of hospital gurney wheels. You can read more stories from the owners here. 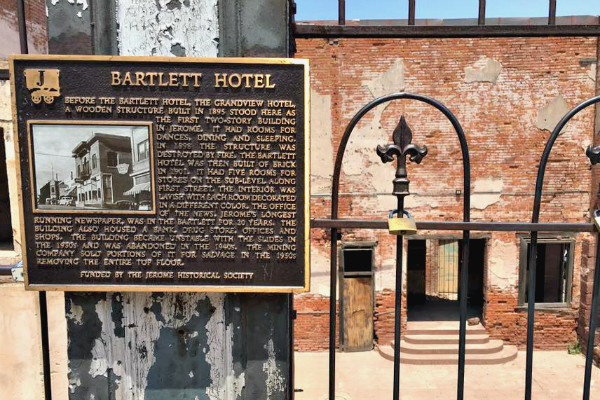 Would you stay in a haunted hotel? If you want to explore the area further, the Jerome State Historic Park is just down the hill (building on the right). The building used to be the Douglas Mansion, built by the former owner of the Little Daisy Mine, and is now a museum of the history of Jerome and the Douglas family. 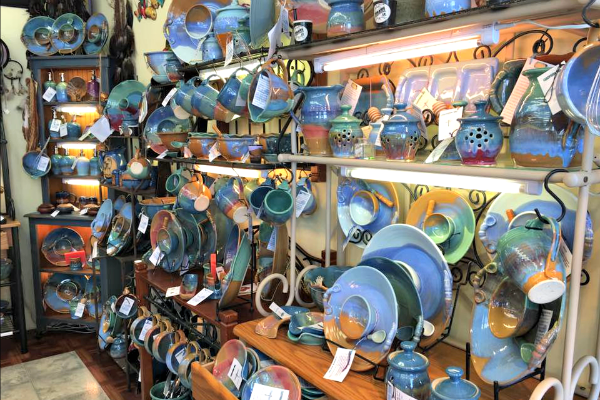 The town also hosts First Saturday Art Walks and an annual Historic Homes tour (in May). If you want to continue your journey, Jerome is less than an hour from Sedona or Prescott and only about 30 minutes to the Verde Valley Wine Trail. 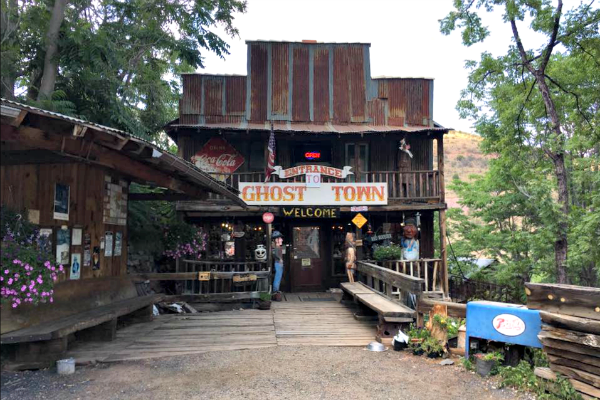 I visited Jerome many years ago; I love ghost towns. 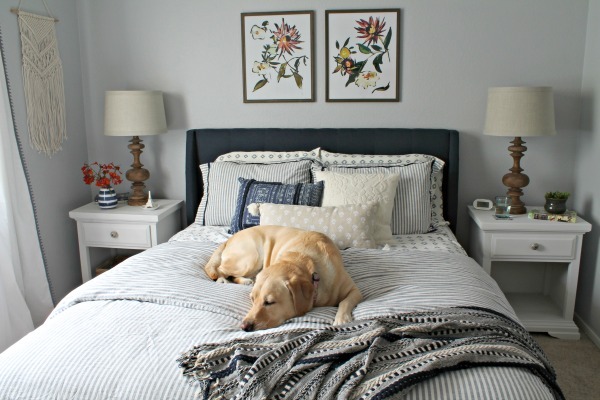 But that "ghost town" you visited sounds like just a clever solution for a hoarder! He was definitely a hoarder! The site used to be a small boom town called Haynes, but I'm not sure how many of the buildings are actually from Haynes or if it's just stuff he added later. 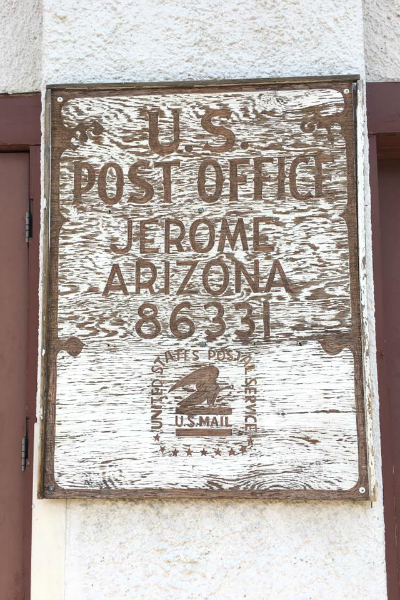 Definitely an old west feel to Jerome! I've only been to northern Arizona which is so different from here. Gonna have to get to Jerome someday! What a cool place to visit! I love that it's an artsy community now, but still has an incredible history!! Jerome looks like my kind of place! I love historical places, especially old Wild West like towns, and don't mind a good ghost town spot. That old mine and junk shop looks like so much fun and given the price it definitely doesn't seem like it can be missed! I also never pass up a good sangria, so it looks like this will be added to our Arizona list!